Lake Erie is the warmest of all of the Great Lakes, but it also freezes over more than the other lakes. It is the fourth largest when measured in surface area, with 9, 910 square miles (25, 700 square kilometers) and the smallest by water volume, with 116 cubic miles (484 cubic km). Lake Erie touches four U.S. states — New York, Pennsylvania, Ohio and Michigan — and the Canadian province of Ontario. Buffalo, N.Y., is on the eastern end, and Toledo, Ohio, is on the western end. 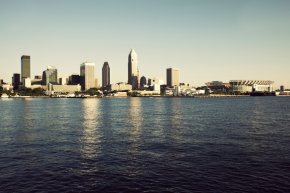 Cleveland, Ohio, and Erie, Pa., sit on the southern shore. As the southernmost of the Great Lakes, the majority of Lake Erie’s water flows in through the Detroit River from the upper lakes — Lake Superior, Lake Michigan and Lake Huron — as well as tributaries such as the St. Clair River and Lake St. Clair. Its main outlet is Niagara Falls. Lake Erie has a tail-like shape, which is reflected in its name, which is derived from erielhonan, the Iroquoian word for "long tail." The lake is about 241 miles (388 km) long, 57 miles (92 km) wide and boasts 871 miles (1, 402 km) of shoreline, including islands. 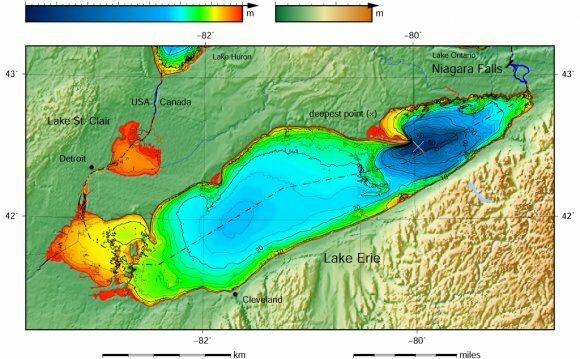 Like all of the Great Lakes, Lake Erie is basically a divot formed from a moving glacier and is relatively young — less than 4, 000 years old — in its current configuration. Lake Erie was the last of the Great Lakes to be explored by Europeans. French explorer Louis Joliet discovered the lake in 1669. The lake played a pivotal role in the War of 1812. The Battle of Lake Erie took place off the north shore on Sept. 10, 1813. U.S. Navy ships defeated the British Navy, gained control of the lake and regained Detroit. 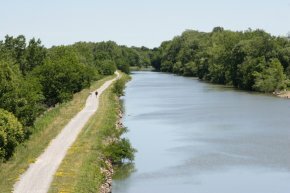 The Erie Canal was one of the first gateways to the West. Completed in 1825, it connected Lake Erie in the west to the Hudson River in the east, a distance of about 360 miles (580 km). It opened up the West to settlers and offered an inexpensive way to transport cargo. It was enlarged in the mid-1800s and again in 1903 to keep pace with growing demands. Today, it is mostly used for recreation. Due to its southernmost position, Lake Erie is the warmest of all of the Great Lakes. While temperatures have reached as high as 85 F (29 C), water temperatures are generally in the low 70s F (21 C to 24 C) during the summer months, making Lake Erie a popular recreational area. During the winter, water temperatures reach freezing, and the lake does freeze over more than the other Great Lakes because of its shallowness. Its average depth is 62 feet (19 m) and its maximum depth is 210 feet (64 m). Ice fishing is popular on Lake Erie. The lake freezes over more than the other Great Lakes. Water levels are 25 to 30 feet (7.6 to 9.1 m) in the lake’s shallowest area, making it possible for strong winds to kick up fairly powerful waves. Lake-effect snow has a huge impact on the surrounding communities, including Buffalo, N.Y.
Lake Erie is popular with sports fishermen and it boasts an extensive walleye fishery. Charter fishing boats also take tourists out to catch small mouth bass. Ice fishing is also popular on Lake Erie. Lake Erie also has its own legendary lake monster — Bessie — which is mostly likely a huge sturgeon. In 1999, Lake Erie was invaded by mayflies, which was seen as a sign of the lake’s return to health and a balance of nature.